This Pumpkins Spice is no latte but a quilt designed by Karen Walker from the blog Laugh Yourself Into Stitches. I shared a link to Karen’s pattern on my blog two years ago and my friend Rae just loved it and made one. This is Rae’s quilt and she used Kansas Troubles fabrics to make her Pumpkin Spice quilt. I chose the Flirtatious pantograph and used Navy So Fine thread on top and Navy Bottom Line on the back. Rae brought a navy flannel backing so we decided to go with a Black Poly batting from Quilters Dream. This quilt arrived at the right time of year to be photographed! I’m kicking myself those as I do have a few pumpkins around and didn’t add them to the photo shoot. Our guild is having a retreat this coming weekend so I am getting a few project ready to take. I loved the Butterflies quilt pattern by Laundry Basket Quilts the first time I saw it and had to make it. I used batik fabrics from my stash and spent the weekend tracing and cutting out the butterflies. My husband even joined me at the kitchen table and traced about half of the butterflies for me! I have all the blocks fused and ready to applique down at the retreat. The one thing I’m trying to decide on is do I embroider the antenna or drawn them on? I embroidered a few already but I wasn’t enjoying the process and my friend Ardelle mentioned she just drew hers on. I’m liking that idea more and more! I have all 30 blocks ready to applique down with invisible thread at the retreat. That should take me awhile. See my post on the finished quilt here! This is Rae’s Quarter Sections quilt and she made the baby version for a gift for a new addition to the family that is arriving soon. This is one of our Highway 10 Design patterns and it is a fat quarter friendly. You only need 5 fat quarters to make this baby sized quilt. I used the Bubbles pantograph for the quilting design, medium green So Fine thread and Quilters Dream Blend batting. Rae brought a cream coloured Minkie for the backing and you can see the quilting design nicely on it. It was a beautiful sunny day today but there is a chance we might wake up to snow tomorrow! This is Valery’s Circle of Friends quilt in xmas fabrics and the pattern is by Michelle Harris of Periwinkle Quilting and Beyond in Saskatoon. 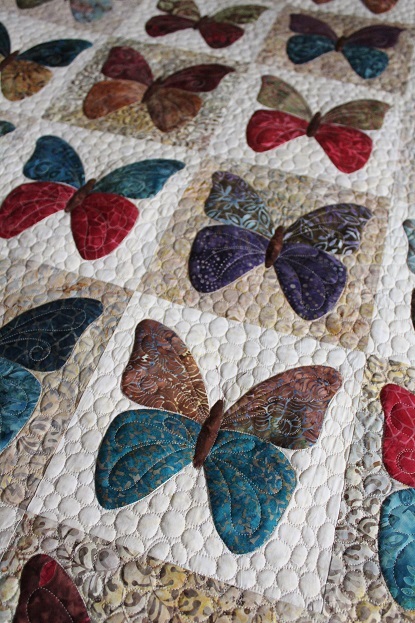 Here is her blog post about this quilt. Valery said she would like it custom quilted and I know she likes feathers so did a combination of flowing feathers and holly leaf motifs. The blocks are all stitched in the ditch and I just marked a circle to create the feathered wreath in the blocks. I used white So Fine thread and white Bottom Line on most of the quilt and changed to red So Fine with red Bottom line in the red border. Love the texture the quilting made on this quilt. This is Valery’s Sticks and Stones quilt which was a block of the month project from Periwinkles Quilting and Beyond in Saskatoon. This is the second one I have quilted, I shared Marg’s Sticks and Stones quilt here. This time I used Whirlygig for the panto design and a medium brown So Fine thread. Valery had brought a golden brown backing but once she saw my selection of Stonehenge backing she decided to go with this one. It matched the colours in her quilt top perfectly! The batting is Quilters Dream Blend. We are having a very nice weekend weather wise and spent Saturday splitting wood with our new log splitter. Don’t know why we didn’t invest in one of these years ago! We are now ready for winter. This quilt is Trina’s Trifecta quilt and the pattern is from Fons and Porter, you can purchase a digital download version here. The pattern was originally done in shades of pink but Trina made this quilt for her daughter who asked it be done in shades of grey….15 shades of grey to be exact! Trina bought all the fabric while she was in the States and then pieced the quilt top when back at her new home in Lima, Peru. She use to live here in Flin Flon but then moved and became my first international client. She has sent me quilt top that she has made while living in Europe and the States and I never know what country she will be sending me quilt tops from next! Since the movement in the piecing is the focus I wanted the quilting to be simple so we chose Northwinds for the panto. I used white So Fine thread and Quilters Dream Blend batting. This is a large quilt, 90” x 100”. I find this pattern quite mesmerizing and love how it builds up to the center. We had our first sighting of snow this week but it melted as soon as it hit the ground. Only 1’c today so time to dig out the warmer clothes! This is Evelyn’s Polar Bear quilt and it is a birthday gift for her son’s 50th birthday. She mentioned that she had purchased these panels and coordinating fabrics many years ago so I don’t think you could find these now. I quilted it with the Bora Bora panto as it looks like the wind blowing in the snowy images. The batting is Quilters Dream Blend and the thread a light blue So Fine. It is Thanksgiving weekend here in Canada and we are having beautiful fall day. It is 20’c and blue skies, normally this time of year it is only 8’c for a high so we are enjoying the warmer weather. The tamarack trees in my yard are just reaching their peak golden colour before their needles fall off. As you can guess this is one of my favourite trees as it is so unique being a deciduous conifer and their needles are so soft. I didn’t adjust the colour on any of these photos, this is their true colour. Here is the second quilt Patty sent from Germany. This one is called American Glory by Peddlecar Quilts and the fabric line is called Faded Splendor by Robyn Pandolph. Patty asked for custom quilting and said she liked feathers so I was happy to make sure there were a few feather motifs on this quilt! I started with the flowing feathers in the outer border and added the piano key quilting in the middle border. The small inner border has a curl feather design. All the borders are stitched in the ditch to define each area. I took these first couple of pictures early in the morning when the sun was low so you can really see the quilting well. I used Quilters Dream Blend batting and a beige So Fine thread on top and a beige Bottom Line in the bobbin. I used a stencils to mark the designs in the center of the stars and center feathered star. Free hand loops frame the flags and I used a ruler to create the simple star design on the flags, the rest was stitch in the ditch. The center feathers star was were I focused the feather motifs and used a few curved QP rulers to create the shapes. This next pictures were taking in the afternoon light. Patty I’m so glad you found my blog and trusted me with your quilts! You were a pleasure to work with!